The labs were made possible by a donation of $1.7 million from Baker Hughes, an oil-field service company. The labs also feature a drill rig simulator — the only one of its kind at any American university — donated by National Oilwell Varco. The labs, which are open to students, are each designed to focus on a different aspect of petroleum engineering. The Drilling Automation Lab, which hosts the drill rig simulator, gives students the virtual experience of actually drilling at a rig site. The Zonal Isolation Lab allows researchers and students to study the effects of drilling deep underground, with a focus on the problems encountered when using hydraulic fracturing methods. Hydraulic fracturing is more commonly known as fracking. Projects in the isolation lab include the improvement of the relationship between concrete and shale and the elimination of hazardous by-products that result from drilling underground water sources. “We were trying to find new formulations to improve the bonding between cement and shale, so that you actually have good zonal isolation,” research associate Sriramya Nair said. “[Zonal isolation] is to prevent contamination of aquifers and also to make sure you don’t have blowouts happen.” Nair said. The third lab houses the Real-time Operations Center. This lab allows data from wells and digging sites from around the world to be seen by students and researchers. Eric van Oort, a petroleum and geosystems engineering professor, oversees all lab developments. Oort, who worked for Shell for more than 20 years, said he developed a number of contacts and relationships with Baker Hughes while in the field. “When I came to UT, Baker Hughes indicated that they had opportunities for sponsorship, and they were interested in sponsoring the [petroleum engineering] program at UT.” van Oort said. According to information provided by Baker Hughes, the total investment budget for the labs was close to $3 million. The Question: Jim Benson, the executive director of University Lands, estimates the UT System’s 2.1 million acres of land will generate close to $1 billion in oil and gas revenue this fiscal year. 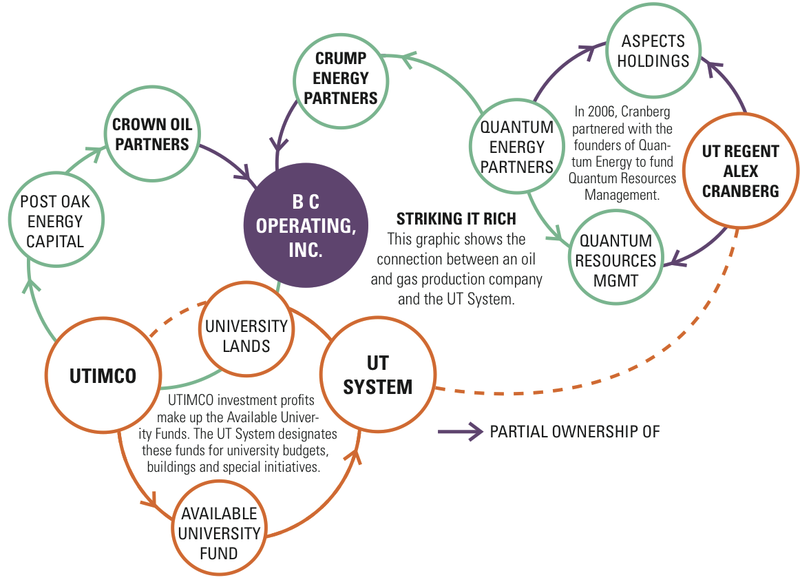 The revenue will be invested by the University of Texas Investment Management Corporation (UTIMCO). Do you think it is ethical for a public university to so heavily fund oil and gas development for its own monetary gain? Yes, I do. This is the first I’ve ever heard about this issue, but I think that there’s nothing inherently morally questionable with a public institution selling public assets to private companies if it’s going toward funding something in the public interest. And I think that if, for example, doing this would allow us to have more competitive programs or lower tuition for most students, I think that withholding the rights to these gas reserves — the social utility of that would not outweigh the benefit of making our University more accessible and more competitive. My answer is “no,” because it’s a public university, and being a public university, its own monetary gain as a corporation wouldn’t be correct, because The University of Texas is part of the government. So they shouldn’t be making profit off of things that, even though they belong to them, shouldn’t be a government thing. To answer the question, it’s not a black or white answer, it’s not a yes or no, because there are so many gray areas involved — where they invest the money and all the logistics of everything that they’re acting in — but I would say that, a public university gaining money off of gas and oil ... I don’t know. I just see a public university as its own entity. It should be able to do whatever it wants. So long as it can keep track of that, and support it as to why — they’re not going to invest their money in goats because they feel like it that week. You know, they’re going to have reasons why. And so I think the student body should at least have a little bit of say, or we should at least know about it. We should have all that access to that information; they should be upfront about it. Maybe it’s an area that they can open up for the student body to get a little more involved in, that way we can make it more ethical. If we’re paying tuition to a public university, and that university is in turn able to have this land that gains the university money that they can invest, the student body who is paying tuition should have a say in where they invest this money. So that’s where I think the real ethics lies. Well, I’m kind of in the middle of that. I see the dilemma in getting funding from other sources. So we do have that land, and we’re able to drill on it, and get the money for our school, and we know that we definitely need that money. But at the same time, I’m kind of on the side where I’m not all supportive of drilling, so it’s definitely a gray area. The environmental issue is a big one. I think there’s a part of me that’s very strong on protecting our environment, and looking at the aspect of nature and taking care of nature and humans alike, versus just making a profit and making decisions based on business. But, there’s definitely a part of me that would see the benefit of something like drilling on our own land, no less. It is ethical, and the reason for that is, a lot of the things that UT does buy, and being a public institution, it’s one of the things that they can invest in. It’s something that’s Texas-based. And even with the University stadium right now, a lot of it’s privately owned and separately UT-owned as well, and I know they’re selling beer for the 10,000 club seats as well. So things like that, which might be controversial, aren’t really affecting students in a negative way. So in that light, as long as it’s ethically done, I don’t think there’s a problem with it. In terms of the actual buying of those resources and using them for students’ gain, I think that’s still ethical. And beyond that, I can’t say too much in terms of what administrators or what students think as a whole, because I think this decision was probably made a long time ago, in the best interest of students and the best interest of the University, so I think as long as we are gaining revenue from that and it’s going into students’ initiatives and programs, then there’s no problem with it. Finance sophomore from Rochester, N.Y. I don’t think there’s a problem with them getting money from oil and gas, but I think there could be a problem with what they’re spending it on. I have a mixed relationship with oil and gas anyway, because obviously I would prefer alternative fuels, but they’re not widespread enough right now that they’re everywhere, so I feel like because we’re in Texas and oil and gas is such a major industry here, I think if they’re going to get money from anywhere, it’s smart for them to get it from oil and gas. As far as making money goes, it’s a good decision. As far as environmental stuff goes, obviously it’s not a good decision, but oil and gas in general is not a good decision as far as that goes.